I suppose this day was bound to come. Maybe deep down, those of us who are Cubs fans all knew it. Here we lie at the inevitable moment where our grand old ball park meets the revenue demands of the modern day and the only way to maintain its existence in a new era is to adjust. It’s uncomfortable. It’s unpleasant. And it’s absolutely necessary.With Chicago Mayor Rahm Emanuel’s “Fenway Plan,” the Cubs potentially could gain in the neighborhood of $150 million in advertising and sponsorships from Wrigley Field and the surrounding streets. It’s a thought that causes excitement for a marketer and terror for a baseball purist. A time where advertising settles into the role of Bad Guy, and people begin to get emotional about the future with a mixture of fear and anger. Some say Wrigley is beautiful and that the addition of a Jumbotron in right field or a lot more ads would be horrible. Some say it’s a wreck and are all for change as long as they don’t have to pay for very much of it at all. And some dare to suggest that the Cubs should move to the suburbs and knock the stadium down altogether. I wager most of those in the last category are the same bright minds who said the Bears should play in Gary. At the end of the day, I turn to the brand itself as my guide. And that’s where the answer of all this becomes clear as day. The Cubs’ brand is Wrigley Field. Think about how rare that is for a moment. We can over-romanticize the Friendly Confines, but there is a very short list of stadiums that are so embedded into their teams that is impossible to unlink the two. This is one of them. In other locations where professional teams are based, you can transport them across town, to a suburb or across a river and the fan base won’t bat an eyelash. But even the brands with the most cherished heritage need to make some concessions to the modern era. The Cubs’ brand is no different. It’s a new ownership, a new management team and even a new philosophy that’s trying to build a culture of winning. Look around the game – is someone going to think Yankee Stadium or Fenway Park is any less hallowed ground because of some giant ads? I’ll take giant ads if it brings a giant championship. 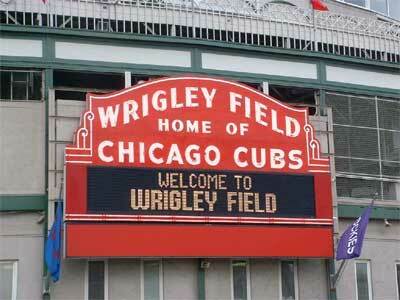 Purists will grumble that a Wrigley with increased advertising upsets the beauty of the place. You know what? They may have a point. But you know what else I’d hate to see even more? A wrecking ball hitting it and watching them play in the suburbs. That my heart could not take (sorry, suburbs). Yes, they have a responsibility to respect tradition, too. Only a fool would make the kind of improvements that practically eliminate the iconic elements that make Wrigley, well, Wrigley – like the scoreboard, for example. The foul poles that carry Jack’s “Hey Hey” catchphrase. The front marquee. The ivy. But there can be a best of both worlds. Advertising does not have to upset the character of a ballpark if done with taste. It’s a challenge. But not an impossible one. Yes, I have not agreed at all with how much some ads have dominated architecture in this town more than ever on Mr. Emanuel’s watch, and I’m an advertising practitioner. But in this case, there’s a difference. I don’t expect bank advertising draped on the Wabash Avenue Bridge but I do expect it in a baseball stadium. Whether or not people welcome it, they expect it. And if you think they’re going to stop coming because of it, I give you Exhibit A: 103 straight years of not winning a championship. They’ll live. They put lights on the place and although there was a stink, most got over it. When the Bears redesigned Soldier Field to look like a spaceship landed in it, some people had a stink and most got over it. By the way, one thing to point out to my social-media brethren who say advertising is “dead” – judging by the mayor’s proposal, it still matters a whole lot. Sure, in our world of tweeting and posting, traditional advertising’s role is rapidly changing. But it’s not going away. And if you’re rooting for this home team’s ability to eventually and consistently compete in baseball’s top tier, you’d better be rooting for advertising and its benefits for the long-term. And when the Cubs win a World Series? Here’s what I think. You’ll be dancing along the blocked off streets of Sheffield and Waveland or inside the stadium watching the last out of the World Series replayed over and over on the Jumbotron.